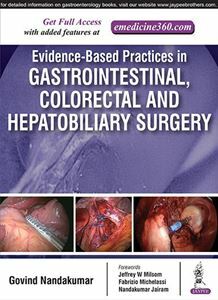 Evidence-based Practices in Gastrointestinal, Colorectal and Hepatobiliary Surgery is meant to be a practical guide for the young gastrointestinal surgeon or trainee. The book has a global authorship and is focused on evidence-based care and multidisciplinary care of the complex gastrointestinal or liver patient. The chapters are succinct yet comprehensive making it an efficient read. The practical approach of the book will make it a good adjunct to textbooks that address the pathophysiology and basic science of disease processes. Chapters 12, 21, 22, 23, 30, 46, 52, 59, 60 and 67 contain video(s).